The success of the school academies programme and the impact it has had in raising school standards across the country was honoured by the Education Secretary yesterday (4 April). 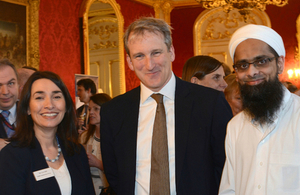 Seventy-six school and sector leaders joined Damian Hinds at Lancaster House to mark the milestone that 50% of pupils in England are now studying in academies and free schools. To celebrate the successes of the academies programme – which placed freedom into the hands of school leaders in thousands of schools across England since 2010 – Mr Hinds hosted leaders from top academies and free schools, including the Harris Federation, Co-op Academies Trust and STAR Academies, to thank them for their hard work. The reception, which was co-hosted with Academies Minister Lord Agnew, also marked the fact that more than 50% of children in state-funded schools in England are now taught in an academy or free school, with standards typically rising faster in many sponsored academies than in similar council-run schools. Mr Hinds also thanked attendees for their dedication to improving education for children and driving up school standards in some of most disadvantaged areas of the country. The overwhelming majority of academies – that’s more than 8,000 schools – tell a positive story. I see and hear about this every day in my job, and we’ve come a long way in the past eight years thanks to the hard work and dedication of teachers and school leaders across the country – including all of you. Many of you run schools in some of the most disadvantaged areas of the country that were previously underperforming – that is no longer the case and parents now have the choice of a good school. The fact that more than half a million children are now in Good or Outstanding sponsored academies that were previously underperforming demonstrates that when schools come together, as part of a multi academy trust, they can achieve far more than they can on their own. I want to take this opportunity to thank you for helping to drive up standards for the next generation – the challenge now is to continue to transform education and encourage other school leaders to do the same. More than 8,300 schools in the country have become an academy or opened as a free school and hundreds of schools each year continue to make the positive choice to become an academy. The academies programme was introduced by the Blair Government in 2000 with the aim “to improve pupil performance and break the cycle of low expectation”. By 2010, there were 203 academies – mostly in inner cities. The 2010 Academies Act gave all schools in England the freedom to choose to become an academy and now over 50% of pupils in the state funded education system are taught in an academy or free school. The reception follows the publication of a research report on the benefits of academies earlier this year that showed that thousands of pupils are benefiting from higher standards in their schools after converting to become academies, and the Education Secretary urging more schools to consider the freedom and opportunities offered by becoming an academy. We want trust leaders to have the confidence to say that their trust is a group of schools working in collaboration as one entity to improve and maintain high educational standards to help local communities thrive by giving children the best opportunities to learn. We have therefore published guidance for trust leaders to help them proudly say that academy trusts are education charities that run schools to give children a better future and advance education for the public benefit.